As a concerned citizen, as a Christian, as the New England Annual Conference chair of the Conference Board of Church & Society, I wrote this letter to the Governor, signed by twelve United Methodist clergy in New Hampshire. An abbreviated version will also be appearing in the Valley News in the next few days. The letter is being sent by mail, and by a link to this post, to the Office of the Governor. As United Methodist faith leaders in the State of New Hampshire, we write to urge you to reconsider your position, which calls upon the federal government to halt the resettlement of Syrian refugees within the United States and, by extension, our state. We want to thank you for your deep concern for the safety of the residents of the U.S. and of New Hampshire in particular. As one of our elected leaders, it is clear that you take your responsibility to public safety seriously and thoughtfully, and you are to be commended for that. There comes a time, however, when the cries and the suffering of our siblings in the human family cannot be ignored or denied; our response cannot be delayed or deferred. Recognizing the unity and interdependence of humanity, we are obligated to respond from the greatest parts of ourselves, not from the fears which would restrain us. These are the very fears on which terrorism seeks to prey. It is fear that would check our compassion, fear that causes us to withhold our welcome. As a nation, our process for screening and evaluating those seeking amnesty as refugees already is thorough and arduous. Halting the resettlement of refugees to re-examine that process, at this moment when the need is so great, is a fear-based reaction that delays justice—and justice delayed too long becomes justice denied. But fear does not have the final say. There is another way: the way of love. Love drives out fear. Loves sees the children and adults fleeing violent regimes as our own children, parents, siblings, friends. Love moves individuals to open their homes, schools to open their classrooms, faith communities to open their piles of donated clothing and household goods, and yes, government bodies to open their borders. Love refuses to sleep at night in the “Land of Opportunity” while huddled masses of people yearning to breathe free are held back behind miles of red tape. Love refuses to enter a season of celebration—of community, of family, of the presence of the Divine with us—while those most in need of that embrace are told there is no room for them at any inn. As we prepare in our communities for even the possibility of receiving refugees, we find in fact that we are drawn closer to one another—faith communities, service organizations, public institutions, and individuals work collaboratively to extend hospitality and welcome in our homes, towns, and regions. The people of New Hampshire are strengthened by this work, not diminished. We are at our best, strongest, most resilient, most connected, and most compassionate selves when we are working together for the good of others. Governor, we hope and we pray that you will continue your deep care for the well being of the people of New Hampshire, and will extend that same, unrelenting compassion and passion for justice to those who are not yet among us. We hope that you will be moved by love beyond the fears pressing around us, and will boldly lead our State in wise, thoughtful, open-hearted welcome to those refugees who seek, like all of us, to live in safety and peace. 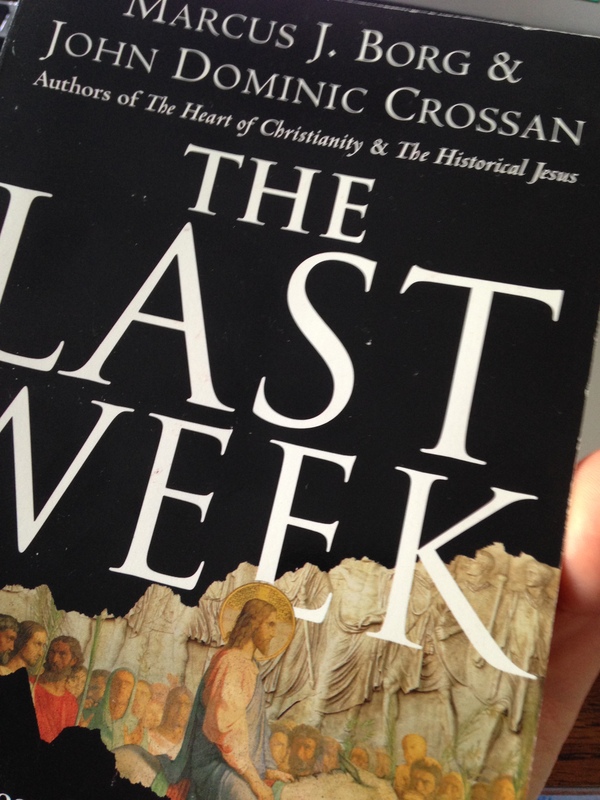 I pulled it off the shelf last night and paged through– a sort of eulogy, a sort of thanksgiving. There are many voices lifted up this week in thanksgiving for the life and evangelism of scholar Marcus Borg. Perhaps all the stories that need telling have been told. But this one is mine. The whole long post is now six and a half years old, and is worth the fun reading if you want to hear me riff on why I dislike The Chronicles of Narnia. I will, however, excerpt some highlights here. My theological problem had always been very simple. I don’t like what most church says about God. So much of what traditional church teaches is about how we need Jesus and Jesus is so good and loving, because God-as-Creator is so abusive and mean. God-as-Creator made people and gave them free will, and constructed a system of God’s own justice wherein those beautiful ones, created in the divine image, cannot receive forgiveness without blood, suffering, and death. That’s not a god I could or can believe in, let alone preach. Sometime in 2007 ish, I attended a lecture in Middlebury, VT at which Marcus Borg spoke. I don’t remember much, and the notes I copiously took are long lost. But I remember his gentleness and conviction. The audience was mostly church people, not scholars– pastors and lay people from a variety of faith traditions. He was speaking a lot about his then-recent book The Heart of Christianity, and about how it could be possible to teach a rich and subtle theology in Christian education, insisting that “regular” church people can and should think deeply about theology. I know, what a concept. But it was radical to some of his audience, or at least what he was suggesting be the content was radical. He handled the comments and questions and challenges with grace, and imparted this vision: that we everyday people could think and teach deeply, and that this would bring people closer to God, and deeper into faith. He demonstrated more than once his famous, humble not-knowing. Borg completely re-explains Jesus as the sacrificial lamb in a way that removes substitutionary atonement from the equation, makes for a much more powerful statement of belief, challenges the systems of sin and forgiveness that require sacrifices in the first place, and is historically valid as a bonus. It goes like this: by the first century, Jewish Temple worship was a well-oiled machine, and it controlled much in the lives of the common Jewish individual. Sin and being unclean were problems not only for the conscience, but for inclusion in the community; a person whose sin had not been forgiven or a person who had been/come in contact with something unclean (so that’s every woman every 28 days, and her husband, most likely) could not be part of ritual, community meals, or have any entrance into the Temple, and thereby entrance into the presence of God and relationship with God. Forgiveness and cleansing of sin/uncleanness required blood sacrifice of certain animals, offered by the priests on behalf of the sinner in the Temple in Jerusalem. So, those Jews who could afford the animals for sacrifices and the fees for the priests and the trips to Jerusalem could have their sins forgiven, could enter the Temple on the High Holy Days, and could stand in the presence of the Almighty. And the rest, well, too bad for them. The Temple priests held a monopoly on sin and forgiveness. They had become the ancient magic, not only demanding the sacrifices, but setting the fees, limitations, and means by which forgiveness and relationship with God were possible. One might say (although Borg did not, but perhaps I can stretch here) that the Temple claimed that they were the way to salvation, that no one could come to God but through them and the expensive sacrifices they required. The claim, then, that Jesus is the sacrificial lamb is not a claim about the human blood required for the forgiveness of sins– that’s not part of Judeo-Christian theology in antiquity. It is a claim about the ritual sacrifice offered only by the Temple priests. To say that Jesus is the sacrifice, that he died and his blood was shed for the forgiveness of sins, is to say that the sacrifices and rituals of the Temple are meaningless. No longer do you need to buy an unblemished calf or travel to Jerusalem or pay the fees for a priest to offer sacrifice on your behalf. Christ is that sacrifice, and the Temple monopoly on forgiveness is no more. Through Jesus, whatever we or others might claim separates us from God has been removed and no further sacrifice is needed. He has, in short, challenged the very authority– that of the Temple– which required blood sacrifice, shattering the barrier between the individual and God’s presence, grace, and abundant life (we see this symbolically as the Temple curtain tears at the moment of the crucifixion; the barrier is destroyed). … If, as Borg insists, we can re-educate the adults of our churches and educate the children as they come through the Christian Education system with what was really meant by ‘Jesus is the sacrifice for sin,’ we have hope of reclaiming Christ’s radical message: that nothing stands between us and the God of life, and no intercessor is needed to stand in the presence of the Holy. Thank you again, kind teacher. All the world is my parish. That’s what Methodism’s founder, John Wesley, said. Ironically, I think he said it to clarify his commitment to itinerant ministry, to his particular sort of traveling, voyaging, never-rooted-for-too-long preaching of salvation in every place he could reach. I might be tempted to say I blog for that reason– to spread personal and social holiness through all the land and all the regions where my pixilated pastoring can reach. But that would not be honest of me. For a long time I thought maybe I blogged because I’m an extrovert, and I wanted more places to talk and think and emote “out loud,” more people with whom to share and converse and dialogue and process. I’ll admit that blogging is good for that. I treasure the conversations I have had through my blog(s) and facebook and other online communities. I admit at least in part that I blog because I hope that it matters, that my thoughts matter, that something I write might be read or shared and might change something or someone, no matter how minutely. I hope this isn’t too selfish a thought. Or too navel-gazing (unlike this post). I know that I *do* think out loud, and that processing through writing helps me clarify my thoughts and ideas. 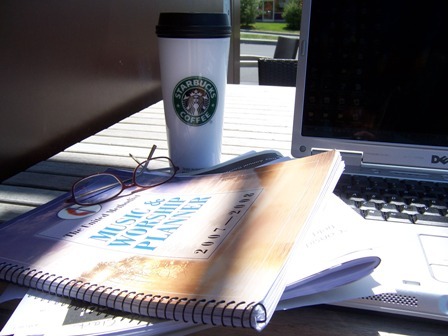 I know that I’m a better preacher, conversationalist, speaker, and a better listener, thinker, silent presence, when I have taken time in writing. And I get better with practice. I can feel that I’m rusty, that this post is hard. But mostly, what I’m noticing about myself, now in my third appointment as a pastor, is that I blog and maintain an online presence (as best I can), and see the world as my parish, as a reaction to, rather than a justification of, the itinerant ministry that John Wesley and the Methodist clergy riding in his horseshoe tracks embrace. That is to say: I don’t blog to reach out, but rather to have a place to touch back. No matter how far I move, or where I go, or how different a local church or conference might be, I am still Becca, or Pastor Becca, or @pastorbecca. I have some continuity in this space, some carry-over readers and listeners, some people who read and remember my posts from ten years ago (and some new congregants who scroll back and read up on me when I arrive, I hear!). That means I have some authenticity, and some accountability here. I have to be the same, evolving, work-in-progress ME I have always been, or y’all would call shenanigans. And I also have a touchstone, a rootedness in my root-less ministry journey. I have people I don’t have to leave and lose, a home church not confined by membership or appointment. A community and– what’s the word– that I can find myself in again and again. Not only as the preacher or pastor, but sometimes, maybe often, as a member and participant. Ah, yes. A parish. A parish I can find in all the world. A poem or monologue, based on Genesis 32:22-31 and Jacob wrestling until he finds blessing. Permission is granted for use in worship etc, but please credit me (Rev. Becca Girrell). Another night, while I slept, I dreamt of heaven, of angels and light and ladders, of nearness and connection and the places where doorways open. Young and hopeful, I knew the comfort of that Presence and Promise, that my Companion would go with me, protect me, sustain me. I’m not so hopeful now. For years I’ve labored, loved, and lied, struggled with my family, my pride. I’ve watched siblings fracture and relationships die, watched labor bear miracles and wounds alike. And so sleep eluded me that night. Presence isn’t so simple, isn’t so easy, isn’t always a promise. My Companion hasn’t always been a comfort, but often a challenge and a burden as well. Love has not always been a gift, but sometimes a contest. Life has not always been a miracle but sometimes a way of hurting one another. I was not surprised that my Companion came. Not surprised when arms encircled me. I couldn’t tell when the embrace became a struggle, which one of us moved first into aggression. Maybe too used to love being a weapon, I didn’t know how to embrace. Maybe (okay, certainly) I was angry, and anger has a way of surfacing. Maybe my Companion wanted to challenge me further, to see how much I could bend before I broke. Once I grappled, there was no way I was letting go. Habits die hard, and I’ve been wrestling for a long time, from before I was born. Wrestling with my brother for birth into this life, grappling with him for a mother’s love, a father’s blessing. I’ve been wrestling with my father in law and his herds, grappling with my wives as they grappled with each other, our tangled lives and loves pulling at one another. I’ve been wrestling with my Companion for a long time too. One who promised to guide and preserve me, to help me to prosper. What have I to show for that? And so I wasn’t letting go. All night we grappled, struggled, pushed and pulled, rolled and wrestled. All my life we have been, we will be. But this time, I was determined. This time, I was going to find the blessing in this curse, the joy in this tangled mess of limbs and lives. My Companion named me, touched me, blessed me. My Companion told me I’d won, let me prevail. But my Companion did more than that. In tangling with my Companion, I also tangled up my understanding yet again. Tangled love and loss, pain and joy, blessing and struggle. Sometimes to love is to wrestle and to wrestle is to love, to challenge and grapple and struggle are to uncover faith, joy, promise. Sometimes to trust is to question and to believe is to wrestle. To love and be loved is to wound and be wounded. To bless and break. To embrace and to grapple. Sometimes we can’t tell embraces from wrestling. Sometimes we can’t tell blessing from brokenness. I’ve been limping ever since. Sermon: Blessed are the Cheese-Makers? 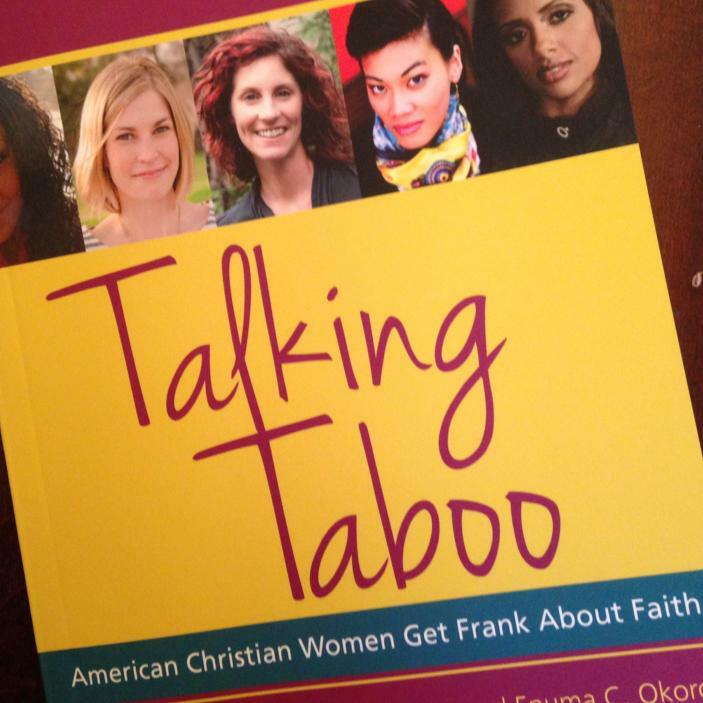 Over a year ago, I wrote an essay for an amazing compilation, Talking Taboo: American Christian Women Get Frank About Faith (Erin Lane & Enuma Okoro, eds), which officially launches today. I’m overjoyed to be included in this book, a huge collaborative effort, and looking at the other authors I’m humbled and a little confused as to why I got to be part of something so cool. My copy came in the mail on Friday, and I excitedly tore into it. And quickly realized that much has changed for me in the past eighteen months or so. And I don’t just mean my name. My essay, “The Pastor has Breasts,” dances in the dynamics of pregnancy, pregnancy loss, breastfeeding, and embodiment as they intersect with personal boundaries. It’s the story of two congregations, three pregnancies, and one scary incident where my lived, embodied authenticity contributed to me feeling too vulnerable and unsafe. I hope people read it not as a cautionary tale about being too approachable or “human,” but as a wrestling with the struggle of embodiment and authenticity in a space and a vocation where those are still challenging and potentially unsafe, particularly for women. I don’t regret the words I wrote, or the story I shared. I think my essay has an important place in this compilation, standing in dialogue with other essays about one’s body and/or about pastoral roles. Surely there are new and relevant stories I can tell from today’s vantage point (and someday may), although other women have written about divorce and relationships, so I’d be in different conversations within the collection. But the biggest difference I see now is how my story about physical authenticity and vulnerability is a metaphor or perhaps an illustration of a larger theme in my life. Just as I embrace my femaleness and my body, not apologizing for the “discomfort” people may feel when forced to deal with the physical reality of who I am, I also strive to be honest about my life and the situations I am going through. In each case, this real-ness is not only something I personally value, but it runs the risk of putting me in situations where I feel more vulnerable– sometimes more vulnerable than I want to be. Coming through separation and divorce and entering into single parenthood in a way that has been public and honest was only somewhat of a choice; there was very little I could hide about my struggle even if I wanted to. The result is that I’m open to support and critique, solidarity and prying questions, affirmation and painful rebuff. If I had the essay to write over, I’d draw out this connection, and talk about how physical and emotional vulnerability intersect in ways both beautiful and damaging. I think this is true for all of us, and might only be elevated in the lives and experiences of women. For me, it’s not a commitment I’d ever want to back down from. I believe authenticity is important and I wouldn’t know how to live, much less minister, in any other way. That this embodiment and authenticity come with vulnerability is a given; that this vulnerability can be too much or even dangerous to physical or emotional well-being is a reason for pursuing strength and wholeness, not for shutting down. I didn’t realize how many of the contributors come from more conservative, evangelical backgrounds and denominations/sects. These contexts have shaped their experiences profoundly, and many of their essays convey the dissonance between where they may have started and where they have come. My writing takes for granted that I’m steeped in mainline to liberal protestant Christianity, which is fine because that is my context. However, there are things I gloss over about that, and seeing it as part of a compilation now, I’d have done more to name the relative openness of United Methodism to women as leaders and pastors, and the progressive theology that is my oxygen, from which statements like breastfeeding my daughter in the sanctuary was sacramental come. I’d have left out the Reverend in my name in my bio, seeing as no one else used it where applicable, and now I feel stuffy. I would of course have changed my last name entirely (the legal change happened even after the very last last last proof went to print), but I am glad I did not excise evidence of my then husband from the piece. He was and is part of the story. I’d have submitted a better picture, without a robe. But hey, I was distracted at the time, and felt horrible about both my body and my life. I didn’t have a lot of pictures of me smiling. Too vulnerable? Too real? Looking for a place to purchase Talking Taboo? 1. Let me know if you’d like to buy a (n autographed) copy from me and I can order up a box to sell and share. 2. Contact a bookstore near you and ask them to carry the book– this is great for spreading the word! 3. Buy from the publisher, White Cloud. Follow more conversation from the editors and contributors at the Talking Taboo blog (webetalkingtaboo), and on Twitter #TalkingTaboo. A child was walking along the road from the convenience store to the suburb, when he was set upon by a man who wanted to be a hero. The man stalked him, engaged him– we do not know for sure how the child responded. And the man shot him, dead. Neighbors heard the altercation outside, but they did not want to get involved and so the neighbors passed by on the other side. Police arrived on the scene, but the man with the gun said he’d been afraid for his own life, and so they did not book him, or take him into custody, or press charges against him, and the police passed by on the other side. The law of Florida retained that a person (although maybe not a black person and maybe not a female person, but a person) could carry and use a weapon, could use deadly force when they believed their life was in danger, and so the law of Florida passed by on the other side. A jury of this man’s peers, not the victim’s peers, not the boy dead beside the road’s peers, but the gunman’s peers, listened to the evidence, tried to determine if the boy had posed a threat to the man with the gun, and they determined the man with the gun was not guilty of murder or of manslaughter, and the jurors passed by on the other side (one of them stopping a day later to sign a book deal). Good Samaritans and Good Samaritans wannabees wept and wore hoodies and mailed empty packets of skittles from the comfort of their quiet neighborhoods and their safe roadways, and, grieving yet alive, passed by on the other side. Martin Luther King, Jr said once that Sunday morning at 11 o’clock (or in our case 10 o’clock) was the most segregated hour in American Christianity, with people worshipping almost exclusively along racial lines. We give thanks that our congregation is blessed by each member, and that we are growing in diversity in many ways—racially, socioeconomically, politically, theologically, in terms of orientation and age and place of origin, and we give thanks especially for our children, who lead us in song and prayer and life together, regardless of the things adults might see as differences. Even so, we recognize the comparative lack of diversity of our church, our community, our state. In 2012, Vermont was ranked as the second-whitest state in the country, falling just behind Maine and just ahead of New Hampshire, with more than 96 % of our population identified as white. This is not a criticism, or at least not one from which I can stand apart—I grew up here too. I’ve lived a life of such white privilege that I often don’t recognize racist jokes or slurs, and that I commit racist actions, on occasion without recognizing what I’m doing. It’s taken me years to come to see and understand white privilege, to acknowledge and see how my life is different because of the color of my skin, and how people make assumptions about me—almost always favorable—based on their perception of my ethnicity. Steeped in privilege as so many of us are—the privilege of being white, or middle class, or from a loving home, and the list goes on—steeped in privilege as we so often are, it is our responsibility to recognize when and where we have privilege and power, and are therefore called to give it away. That makes us turn to Jesus’ apparent motivation in telling this parable. We are familiar with the story, and we so often focus on the compassion and charity of the Good Samaritan. Sometimes we look beyond to the greater justice issue, standing yet again in the legacy of MLK when he said in “A Time to Break Silence” at Riverside Church, “On the one hand we are called to play the good Samaritan on life’s roadside; but that will be only an initial act. One day we must come to see that the whole Jericho road must be transformed so that men and women will not be constantly beaten and robbed as they make their journey on life’s highway. True compassion is more than flinging a coin to a beggar; it is not haphazard and superficial. It comes to see that an edifice which produces beggars needs restructuring.” In fact, in saving this text until after our guest preacher, this was what I had initially planned to preach about. But that’s not what Jesus is saying to the lawyer who asks him this question about what it means to be a neighbor. That is not the point of the story. Not today. We are not the Good Samaritan. We want to be. We strive to be. We name our homeless shelter—that we keep in another town so we don’t have to look at it—after the Good Samaritan, but that is not us. And this isn’t a parable about how to be the Good Samaritan, or how to cultivate charity in our hearts. 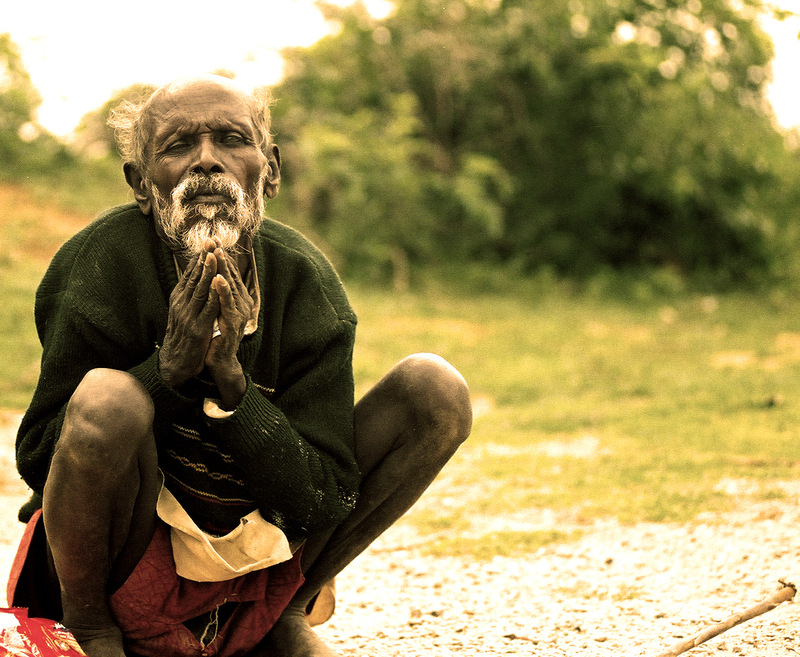 We are not the robbers, whose situation we don’t know, what deprivation and fear they faced in their lives. We are not George Zimmerman. 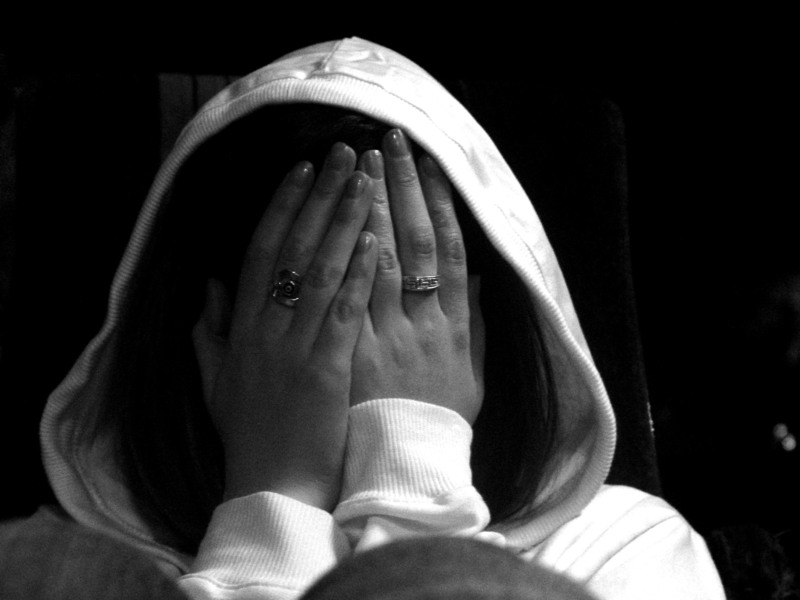 We are not, today, in this story, reflecting on the violence we do in our lives. That’s a powerful and important reflection, but it is not the point of the parable. We are not the man on the road, the child walking back from the convenience store, robbed and beaten and left to die, stalked and shot and dead on the ground at 17. We are not Trayvon Martin. In the days after his death, and again after the Zimmerman verdict, some people began posting pictures of themselves in hoodies and captioning or hashtagging “I am Trayvon Martin.” But then someone else began a tumblr—a site to share pictures and thoughts on a single theme or idea—entitled “We Are NOT Trayvon Martin.” People there post their recognition that none of us are actually this young man, and many non-black folks reflect on the privilege and safety they and their children enjoy, which the Martin family does not. It becomes an opportunity to confront the white privilege I mentioned earlier, and to reflect on the disparity and brokenness of our society. None of us, not even those of us of color, are Trayvon Martin. Some of us could be, or our loved ones could be. Be we are here and whole and alive. And so we cannot appropriate his experience or his family’s loss. Jesus is not talking to Trayvon Martin, to the boy on the sidewalk, the man on the road to Jericho. Jesus’ caution to us, to us all, to all his listeners, to the lawyer that asked him the question, is that we are the priests. We are the judges, the police, the mild mannered citizens, the members of the jury, the neighbors failing to be neighborly, the travelers on the road, who see the man bleeding out on the pavement, and pass by on the other side. Because we are busy. Because we are afraid. Because we are complacent. Because we have seen it too often. Because we have seen it not enough. Because we benefit from the privilege we have, we swim and breathe in it as a sponge in the ocean. And we don’t need to concern ourselves with children lying in pools of blood. We pass by on the other side. We live and work and flourish in a system that is flawed and unfair and broken. A system that defends itself, protects itself. A system that last week did not fail. It worked. It worked to protect George Zimmerman, and the Stand Your Ground Law and the status quo and the culture of fear and violence and its very self. It failed the Martin family but it’s not meant for them. Anymore than it’s meant for Marissa Alexander, age 31, convicted in May 2012, three months after Trayvon Martin was shot, and about the time when Zimmerman’s plea of not-guilty was accepted at his arraignment, Marissa Alexander was convicted of aggravated assault with a deadly weapon, when she fired a warning shot into the ceiling, in an attempt to get her abusive estranged husband to leave her home. Like Trayvon Martin, she is black. Like George Zimmerman, she pled not guilty and her defense argued that she “stood her ground” in a life threatening situation. Like neither, she will see her next birthday—and, unless there is a successful appeal, about 19 more of them—in prison. There is something I notice about the parable of the Good Samaritan: Jesus doesn’t give us any detail about the person on the road to Jericho, except to say that he is male, I suppose. We do not know the color of their skin, or what they were wearing, or whether or not the robbers felt the person was “a threat.” Jesus does not pause to make a case that the person beaten by the roadside is of sacred worth. It is presumed, as a given, that all people are sacred, that all people should not be passed by. This needs no argument. Not for Jesus. And for those who would live as his body in the world, not for us. 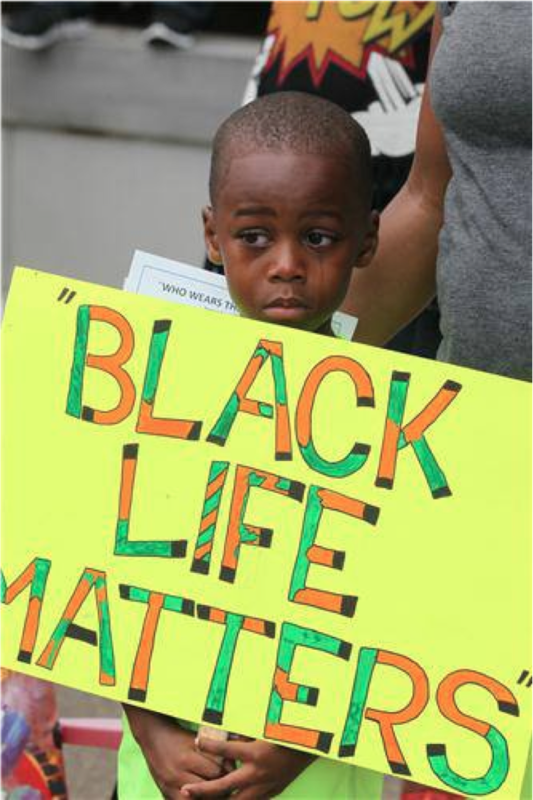 Black Life Matters. Life of all colors and ages and orientations and economic statuses and faiths and abilities matters. Jesus is asked to clarify what it means to be a neighbor—and there the distinctions matter, come into play. There it matters that the Samaritan, with very little privilege or power, gives what he has to the aid of a person in need, while the privileged, powerful, pious elite pass by on the other side. But when it comes to who the people in trouble are, who the people whom we must not pass by ARE, it does not matter. They are people, and that is all we need to know. Need is indifferent to color and status and privilege. The call to act is not. Those who have the greatest power and privilege are called to give it up on behalf of… on behalf of anyone. No distinctions, no exceptions. Who do we see and value? Who do we rush to help? Who can we not leave on the roadside? Jesus assumes we already know the answer, and I think deep down we do. Everyone. In Christ’s eyes, in God’s eyes, we are all of sacred and profound worth, and we are called to see that in one another. We, Jesus warns, are the ones with the power. The power to protect ourselves and our culture of fear and violence and the status quo. Or the power to lay down what we have for any single person in need, any creature suffering. The story, the reminder, is for us. There is no excuse. May we open our eyes, and never, or to the best of our ability never again, pass by on the other side.